HOUSTON (CNS) — For Sister Mary Brendan O’Donnell, it was a baby afghan she made for the newborn child of George H.W. Bush and his wife, Barbara Pierce Bush. For Father Christopher Nguyen, it was President Bush’s administration that welcomed him to the U.S. as a Vietnamese refugee. Like many around the world, and especially in Houston, the lives of a consecrated woman religious and a Catholic priest were changed because of the nation’s 41st president. Sister O’Donnell beamed as she remembered the soft colorful blanket. She had crocheted it herself and hand-delivered it to the Bushes for one of their newborn children at a Houston Astros baseball game. Decades later, she found herself in line with thousands to pay her respects to the late president at his own parish church, St. Martin’s Episcopal Church in Houston, the night before his Dec. 6 funeral. Sister O’Donnell said she was there to represent her convent, the Congregation of the Incarnate Word and Blessed Sacrament, and the sisters’ prayers for the repose of his soul. “I loved President Bush. Truthfully, he had been very special to me,” said Sister O’Donnell, who is Irish by birth and nearly 90 years old. She has lived in Houston for 70 years with her congregation. She had missed Barbara’s funeral arrangements after the first lady’s April 18 death, and made sure to attend Bush’s public viewing in Houston. Inside St. Martin’s, Sister O’Donnell made the Sign of the Cross and clasp her hands in prayer when she walked by Bush’s casket, draped with the American flag. Sister O’Donnell and Bush had several things in common: their love for their faith, a strong heart to serve and a fiery passion for baseball. When George and Barbara made Houston their home nearly 60 years ago, the couple made St. Martin’s their parish church; they prayed together there for more than 50 years. During those decades, many say Bush served with the common and public good with a quiet, confident leadership. It was in the ballpark, where Bush and Barbara had front row seats, where Sister O’Donnell and her fellow sisters grew close with the Bush family attending many games over the years. Bush, himself a former player and then ardent fan, had led Yale to the two College World Series as captain. He threw left-handed. Sister O’Donnell was a longtime history teacher at the all-girls Catholic prep academy that was across the street from the stadium. Fans could sometimes hear the church’s bell tower on Saturday game days. A presidential power couple and a group of Catholic sisters were pretty hard to miss. Standing outside his parish of St. Matthias Catholic Church in Magnolia, where he is pastor, Father Nguyen stood watch for the Bush’s funeral train to pass Dec. 6. The rail procession was set to pass directly in front of the parish church and had already passed a Catholic high school. Wearing a cowboy hat and red, white and blue socks, he said he was grateful to Bush and his administration for allowing him to enter the U.S. as a refugee escaping Communist Vietnam in 1989. He remembered hearing his name over his Malaysia refugee camp’s speakers, a summoning that would begin his refugee process to the U.S.
He’d be sent to Texas, the United Nations worker told him. He didn’t know much about Texas, but he knew there were cowboys and horses from the one cowboy Hollywood film he saw. Now, a priest of the Archdiocese of Galveston-Houston, he leads a growing northwest Houston parish, one whose patriotic parishioners have turned out in force to honor Bush as his funeral train would pass directly in front of the church. The Union Pacific Railroad passes through the heart of Magnolia, a small city surrounded by farm land and Texas trees. Father Nguyen said he focused that morning’s homily on being thankful to God for His many blessings. Despite a busy parish — a Christmas party was cut short and a funeral delayed so guests could view Bush’s train — Father Nguyen joined many of his parishioners and moved closer to street’s edge that ran parallel to the train’s tracks. When Bush’s blue and white train emerged from behind the tree line, the little town of Magnolia grew silent. American flags held high, thousands quietly honored their late president in his casket, clearly seen through glass windows. 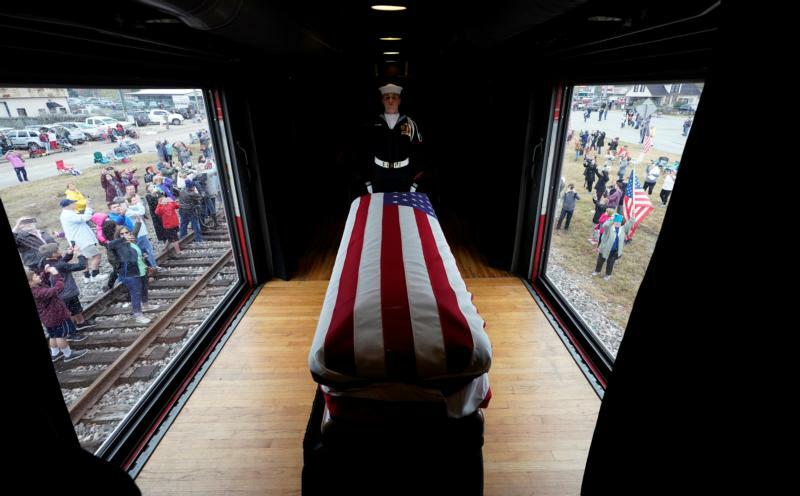 Under the gaze of the parish’s Sacred Heart of Jesus statue facing the passing train, Bush’s casket moved forward to College Station, to finally join his wife and daughter in their family resting place. Ramos is a staff writer and designer for the Texas Catholic Herald, newspaper of the Archdiocese of Galveston-Houston.